So apparently tomorrow is Michael Vick’s 30th birthday. And he had a party, promoted by his leg-stomping brother, at a club in Virginia Beach last night. Oh, and someone got shot. The story goes that Quanis threatened to smash birthday cake in Vick’s face, or that he actually smashed the cake in Vick’s face. Another version is that someone smashed cake in Quanis’ face — or threatened to smash it in his face. Anyway, the confrontation moved outside — where I’m told there were several still cameras and video cameras. Cooler heads did NOT prevail, and ‘Q’ was shot in the shopping center parking lot. 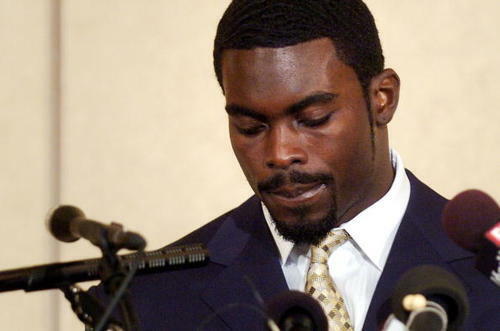 Of course, Vick’s lawyer says he wasn’t present when the shooting took place. Update: So, if you don’t remember all the details of the Bad Newz Kennels investigation and judicial proceedings, Phillips was one of three of Vick’s friends who accepted plea agreements — putting Vick in a “legal checkmate” that forced Vick to plead guilty as well. All of which is to say, these guys have history. If it becomes at all apparent that we are wrong, it won’t take very long to make that change. Tagged with Birthday Party, Brother, Cake, Denial, Dog Fighting, Lawyer, Michael Vick, Quanis Phillips, Shooting, Jeffrey Lurie, Bad Newz Kennels. June 25, 2010 by Brian Solomon.